The famous Hotel "Zacharakis" is located in the amazing landscape of the village Tsapournia, which is rightfully described as "Little Switzerland". It is a modern complex, surrounded by a dense fir-tree forest of exceptional beauty. The complex consists of apartments with stone fireplace and a traditional Greek tavern, where visitors can taste delicious local dishes. 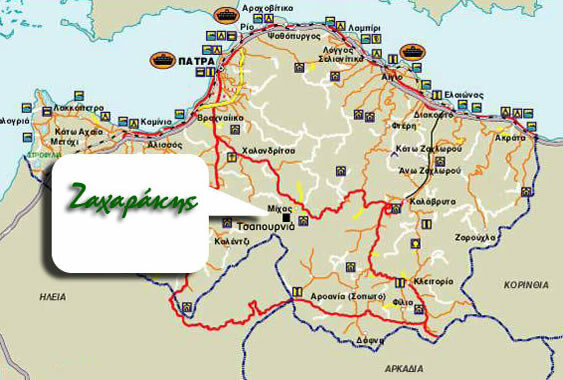 Getting there is easy; follow the road that links Patras with Kalavrita through Chalandritsa. You will have to pass village "Kompigadi" and turn right; then follow the route that passes through a dense forest of fir-trees. 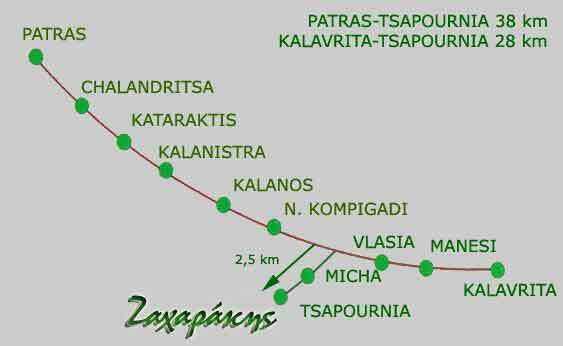 Tsapournia is just 2,5 km away. The Hotel "Zacharkis" is a family business that was built with love and hard work by all members of the family. A lot of people visit the hotel every year, in order to explore the area, as it is suitable for trekking and climbing. Tsapournia is a popular tourist destination throughout the year. Many tourists visit Tsapournia during the summer, in order to enjoy the cool and healthy climate of the area. The first part of the hotel is renovation and expansion of the old building. The beauty of traditional luxury and the excellent services provided by the owners of the hotel, will satisfy every guest. In the new stone building, which started its operation recently, there are 10 rooms with fireplace and 5 apartments without a fireplace, all with independent heating and excellent facilities. The Restaurant of the complex is very famous. A lot of people visit it every day, especially on Sunday, to enjoy homemade cusine and taste local products, such as local meat, traditional pies, cheese, and handmade bread in a warm and family atmosphere. The Hotel "Zacharakis" is a magnet for the lovers of the natural beauty, as it is surrounded by a dense fir-tree forest of exceptional beauty and many natural springs and caves. The area is protected by National and International Treaties; it is a Natura area. The nearby mountains of Erimanthos, Olenos and Mouggila are ideal places for walking, trekking and cycling.